ACS 200 is the leading silver preparation in the world with over 19 patents and stringent independent testing confirms that the ACS200 is 100's-1000's of times more effective than the other 2 leading brands of silver in the USA. The patented production process creates silver ions that remain stable and are able to regenerate themselves. The study below compares the effectiveness of the ACS 200 to the other silvers. 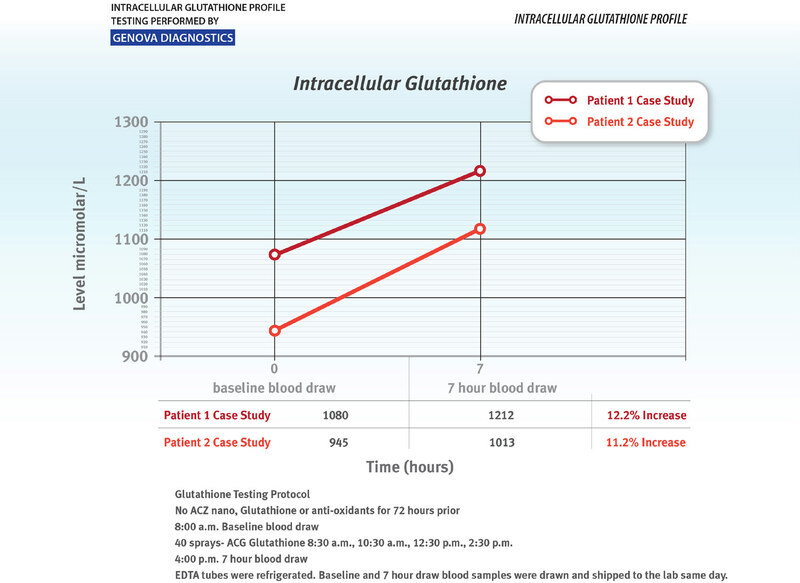 ACG Glutathione is an oral glutathione spray that can effectively raise intracellular glutathione levels by up to 12% in under 7hrs. Glutathione is one of the most important anti-oxidants in the body. Silver has been known for its medicinal and antimicrobial properties for thousands of years. Hippocrates, “Father of Medicine,” used silver for tissue repair & wound healing. In 69 B.C. silver nitrate was described in the contemporary pharmacopoeia. The ancient civilizations of Greece and Rome used silver to control bodily infection & prevent food spoilage. The King of Persia used silver containers to carry water to prevent contamination. Throughout the ages, the ‘Metal of the Moon’ as it was known to some of the ancients has been used effectively for numerous medicinal purposes. Beyond prescribing any silver-based product for its antimicrobial effect, it is necessary in successful practice to distinguish the vast differences in performance amongst competing brands. Clearly silver is not just silver. Major formulation advancements have been made in the last 150 years since the first electrolytically produced colloidal silvers came into existence. To understand the difference in antimicrobial activity between the leading evidence based silver products currently available, we need only compare kill kinetics studies against various benchmark microorganisms. The most effective antimicrobials within the clinical setting are defined as broad-spectrum; exhibiting bactericidal, virucidal, fungicidal and more in killing effect. As there are a near infinite number of types, and genetic variations of pathogens, antimicrobial research is best accomplished by Association of Analytical Communities (AOAC) standard, invitro kill time studies. This is the same protocol utilized by the Environmental Protection Agency (EPA) in determining the germicidal efficiency of a pesticide/disinfectant. The AOAC protocols are accepted and recognized as standard. In my investigations, I have compiled kill kinetics data of three of the better known silver-based antimicrobial products currently on the market, which I obtained from the manufacturer’s own websites. Included in this comparative analysis are the independently derived, and independently published kill kinetics test results of Results RNA Advanced Cellular Silver (ACS) 200®, American Biotech ASAP silver® and Purest Colloids, Inc. MesoSilver® against three benchmark microorganisms; Methicillin‐resistant Staphylococcus aureus (MRSA), Candida albicans, and Staphylococcus aureus. Titer: Synonymous with Microbe Concentration. Titer refers to the number of organisms calculated in the culture prior to testing. Log Reduction: Defines the percentage of kill in logarithms. ACS 200® Extra Strength (tested by AOAC) provides a >6.64 log reduction/99.999984% complete kill in less than 3 minutes. ASAP® silver provides a >4.98 log reduction/99.9989% complete kill in 60 minutes. The 2.17 X 109 ACS 200® Extra Strength titer is 1,142 times larger than the 1.9 x 106 ASAP® silver titer. The 2.17 X 109 ACS 200 titer is 1,808 times larger than the 1.2 x 106 MesoSilver® titer. ACS 200® Extra Strength achieves complete kill (without a single organism left alive) against 2,170,000,000 MRSA organisms in less than 3 minutes. ACS 200® Extra Strength achieves a significant 20 times faster kill than ASAP® silver against Methicillin‐resistant Staphylococcus aureus evidencing a 3 minute/99.999984% >6.64 log reduction versus a 60 minute/99.9989% >4.98 log reduction, while killing an 1,142 times greater number of MRSA organisms. ACS 200® Extra Strength achieves ­­a significant 100 times faster kill than MesoSilver® against Methicillin‐resistant Staphylococcus aureus evidencing a 3 minute/99.999984% >6.64 log reduction versus a 300 minute kill time, while killing an 1,808 times greater number of MRSA organisms. ACS 200® Extra Strength provides a >5.95 log reduction/99.99989% kill in 2 minutes. ASAP® silver provides a >4.83 log reduction/99.9985% kill in 60 minutes. The 4.45 x 108 Candida titer (ACS 200® Extra Strength) is 342 times larger than the 1.3 x 106 Candida titer (ASAP® silver). The 4.45 x 108 Candida titer (ACS 200® Extra Strength) is 37,083 times larger than the 1.2 x 104 Candida titer (MesoSilver®). ACS 200® Extra Strength achieves complete kill (without a single organism left alive) against 445,000,000 Candida organisms in less than 3 minutes. ACS 200® Extra Strength achieves a significant 30 times faster kill than ASAP® silver against Candida albicans evidencing a 2 minute/99.99989% >5.95 log reduction versus a 60 minute/99.9985% >4.83 log reduction, while killing a 342 times greater number of Candida organisms. ACS 200® Extra Strength achieves ­­a significant 720 times faster kill than MesoSilver® against Candida albicans evidencing a 2 minute/99.99989% >5.95 log reduction versus a 1,440 minute kill time, while killing a 37,083 times greater number of Candida organisms. ACS 200® Extra Strength provides a >5.37 log reduction/99.9996% kill in 15 seconds. ASAP® silver provides a >5.06 log reduction/99.99914% kill in 60 minutes. The 2.34 x 108 ACS 200® Extra Strength titer is 101 times larger than the 2.3 x 106 ASAP silver titer. The 2.34 x 108 ACS 200 titer is 281 times larger than the 8.3 x 105 MesoSilver® titer. ACS 200® Extra Strength achieves complete kill (without a single organism left alive) against 234,000,000 S. aureus organisms in less than 15 seconds. ACS 200® Extra Strength achieves a significant 240 times faster kill than ASAP® silver against S. aureus evidencing a 15 second/99.9996% >5.06 log reduction versus a 60 minute/99.99914% >5.06 log reduction, while killing 101 times greater number of S. aureus organisms. ACS 200® Extra Strength achieves ­­a significant 5,760 times faster kill than MesoSilver® against S. aureus evidencing a 15 second/99.9996% >5.06 log reduction versus a 1,440 minute kill time, while killing a 281 times greater number of S. aureus organisms. As you can see, the performance of these three silver formulations differs greatly. ACS 200® Extra Strength achieves 100’s of times faster kill in just minutes, against thousands of times greater number of pathogenic microorganisms.